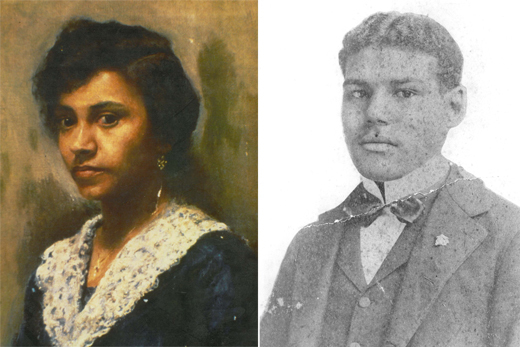 The Harleston collection consists of the papers of Edwin (right), an African American portrait painter and sketch artist, and his wife, Elise, one of the first female African American photographers. The family papers of artist and civil rights activist Edwin Harleston are fully processed and open to researchers and the public at Emory University's Manuscript, Archives, and Rare Book Library (MARBL), located in the Robert W. Woodruff Library. The Harleston papers join the rapidly expanding collections at MARBL from artists, art historians and art collectors such as Amalia Amaki, Benny Andrews, John Biggers, Camille Billops, Cedric Dover, Paul Jones, Samella Lewis and James A. Porter. The Harleston collection consists of the papers of Edwin (1882-1931), an African American portrait painter and sketch artist, and his wife, Elise (1891-1970), one of the first female African American photographers. Among the correspondence are letters between Edwin and W.E.B. Du Bois, his mentor and professor during his time at Atlanta University, and personal letters between Edwin and Elise. Other materials in the collection include duplicates and slides of some of Edwin’s portraits and drawings, as well as sketchbooks and loose sketches; Edwin’s notes and manuscripts for his traveling lecture series created during the Depression when portrait commissions were scarce; and other personal and business-related material. Mae Whitlock Gentry, a former staff writer and editor at the Atlanta Journal-Constitution, donated the papers to MARBL in November 2010. She is the great-niece of Edwin and Elise Harleston and Edwina’s daughter. Gentry says she considered other institutions in the Harlestons’ native South Carolina as well as New York City and Atlanta, but decided on Emory for several reasons—including recommendations from others who have placed their collections with MARBL, such as Camille Billops, an artist and collector of African American cultural materials. “I felt Emory would be the best steward of the collections,” Gentry says. “I chose Emory because I knew they would process and maintain the collection, and make it accessible to researchers.” Gentry also was very aware of the scope of MARBL’s African American Collections, due to her friendship with Burkett. “He’s built a wonderful repository of historical documents that really capture the African American experience,” she says. The Harlestons opened their own photography and portrait studio in Charleston in 1922, with Elise often taking photographs from which Edwin painted his portraits. At the same time, Edwin also worked in the family’s funeral home business to support his family. He had earned a B.A. degree at Atlanta University in 1904, and studied at the Museum of Fine Arts in Boston from 1905 to 1913. Born one generation out of slavery and of mixed race heritage, Harleston was partly influenced as an artist by the grand portraits such as those hanging over the mantels in the homes of wealthy white people, Gentry says. Harleston wanted to create the same type of portraits depicting African Americans; up to that point, their portraits overwhelmingly had been caricatures of mammies or the stereotypes later common in marketing such as Aunt Jemima and Old Black Joe, she says. Harleston painted the portraits of wealthy black businessmen, including Jesse Binga, a black banker in Chicago, and Alonzo Herndon, the first black millionaire in Atlanta. But he also created paintings and drawings of other African Americans in all walks of life. MARBL will hold a symposium based on the collection in fall 2013. Panelists will be announced prior to the event. To view the collection, visit the “Using MARBL” page for more information and to request materials.